It was over a decade ago that I discovered the joys of homemade whole grain bread. I had no choice at the time – we were living in a small town and our local grocery store didn’t have a single loaf of dairy-free healthy bread for this wheat lover. My husband eventually cut out gluten and my bread-making went on hiatus. But when my niece joined our household, the oven began churning out weekly loaves of tender, warm whole grain bread once again. Wheat is actually a safe food for my teenage niece, but due to her many other allergies, we couldn’t find a suitable bread for her at the grocer. She now bakes at least one loaf of 100% whole wheat bread a week for sandwiches and toast, but this week, I got back in the kitchen and made a vegan variation on our favorite recipe and spiked it with Bob’s Red Mill 8 Grain Hot Cereal. You can see the little grains peeking out on the top of the loaf in the picture above. The wholesome 8 Grain Mix adds “nuttiness” thanks to the sunflower seeds and flaxseeds, while the tiny little whole grains provide AMAZING texture, flavor, and nutrition (it provides another 12 grams of fiber and 18 grams of protein to this loaf). And some of you might be wondering, how did I get whole grain bread that is so darn fluffy?! This really is a light, tender whole wheat bread loaf, like one that you might find at the grocer, but without additives, preservatives, dough conditioners, refined flours / sugars or other questionable ingredients. The secret lies in two amazing pantry supplies: white-wheat flour and wheat gluten. Hard white-wheat flour was a best kept baker’s secret that really isn’t very hush-hush anymore. You can find it at the grocery store or online with ease, and it is 100% whole wheat. The name, white-wheat, is a bit deceiving. It is stone ground from non-GMO whole grain white wheat berries (instead of more traditional red wheat berries), with the bran, germ and fiber all in there. Nutritionally speaking, white wheat berries are on par with the very hearty wheat flour we’ve come to know, but it has a slightly sweeter taste, lighter texture and creamy color that rolls up into a pretty scrumptious loaf of 100% whole wheat bread. Wheat gluten is the protein in flour that naturally gives bread its characteristic tender, fluffy and chewy textures. However, whole wheat flour contains less of it than all-purpose or white bread flour, which is why wheat bread is often denser and more crumbly. Adding about 1 tablespoon wheat gluten (it is also easy to find in stores or online and one package lasts for many loaves) per 1 cup whole wheat flour is the formula that I like for 100% whole wheat or whole grain bread. My breakfast favorite: Slather a slice with lightly salted almond butter and sprinkled with cinnamon. Serve with hot tea. My niece’s favorite: Blend honey (or agave) with dairy-free margarine (such as Earth Balance) and generously spread on a very thick slice. 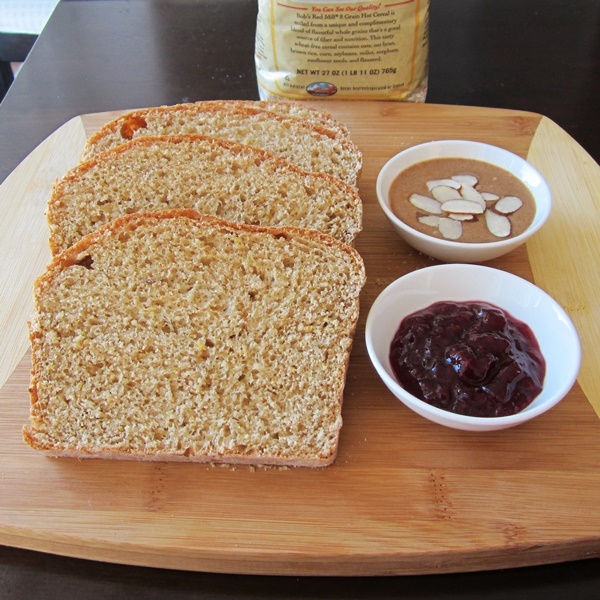 Household lunchtime favorites: Almond butter and all-fruit jam sandwiches or turkey sandwiches. 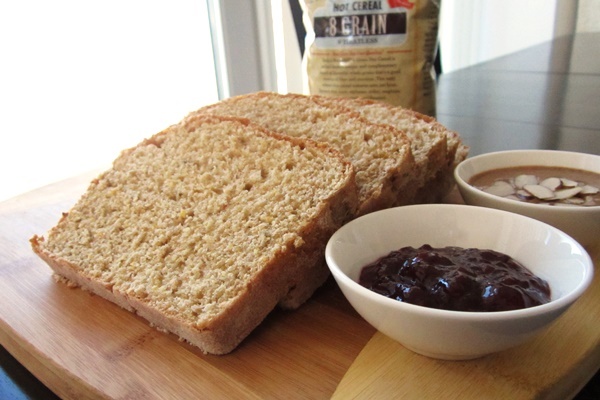 What’s your favorite way to enjoy whole wheat bread? 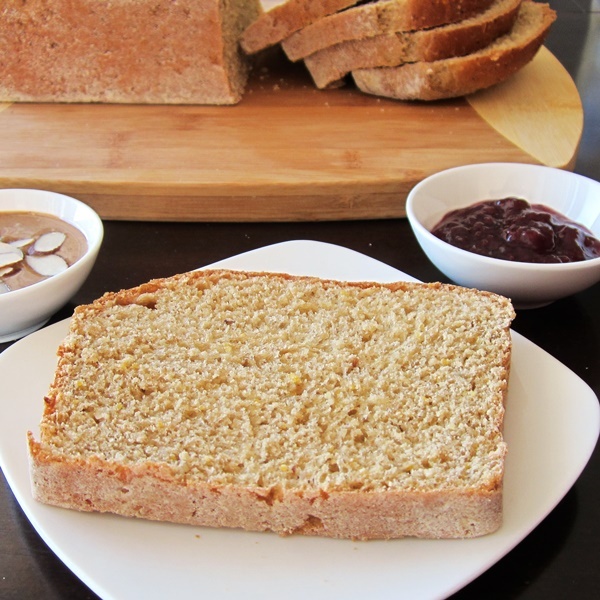 By ingredients, this whole wheat bread recipe is dairy-free / non-dairy, egg-free, nut-free, peanut-free, vegan, vegetarian, and refined sugar-free. The 8 Grain Hot Cereal mix does have cracked non-GMO whole soybeans. For soy-free, you can use the 7 Grain Hot Cereal. I am proudly an ambassador for Bob’s Red Mill and created this recipe to highlight the many uses of their amazing hot cereals. That said, I’ve been a devoted purchaser of Bob’s Red Mill products for my cooking and baking needs for years! 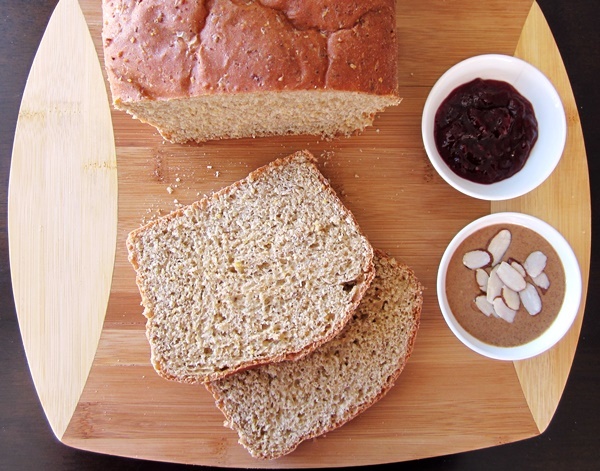 You won't believe how sweet, fluffy and tender this whole wheat bread is! 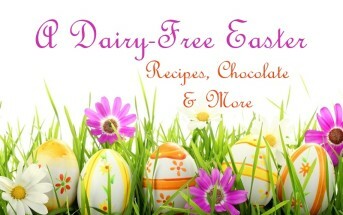 It is a naturally dairy-free and vegan staple in our home. Note that the prep time does not include rising. Bread is actually very quick to make when it comes to hands-on time; it just requires patience! Pour water in a large bowl. Sprinkle with yeast and let sit for 5 minutes. If it doesn’t become foamy, your yeast may be old and inactive. Consider starting over with fresh yeast. Stir the oil, sweetener, gluten, salt, 1 cup flour, and the 8-grain mix into the yeast-water mixture, mixing until well combined (by hand or using a mixer with the dough hook attachment). Add 2 cups wheat flour, and mix again until well combined. Begin kneading with your hands when it becomes too thick to stir. If the dough is too sticky to handle, add more flour, 1 tablespoon at a time, until it is still a little tacky, but doesn’t stick significantly to your hands. The 8-grain mix will soak up some of the moisture as it cooks, so you don’t want the dough to be on the dry side. Knead the dough for a few minutes. Place dough back in the bowl, cover, and let rise in a warm, draft-free place for about 1 hour. Thoroughly grease and flour a 9x5-inch loaf pan. Punch dough down, and briefly knead to get any air bubbles out. Shape dough into a loaf that will fit in your pan, folding under as you shape so that the seam is on the bottom. Plop the loaf shape into your prepared pan. Lightly cover (with plastic wrap or a damp tea towel) and let rise in a warm, draft-free place for 1 hour, or until it has risen to near a full loaf size, and the crown of the dough is peaking about an inch above the pan. Bake the bread in your preheated oven for 35 to 45 minutes, or until the crust is golden and relatively firm to the touch. Pop the loaf out and let it cool completely on a wire rack before wrapping in plastic wrap or storing in an airtight container at room temperature. If you are in a humid climate, you may need to refrigerate or freeze the loaf after 2 days to keep it fresh. Really great recipe. I follow the Whole-Food, Plant-Based diet (e.g. like Forks Over Knives) and use applesauce instead of oil when I make your recipe. 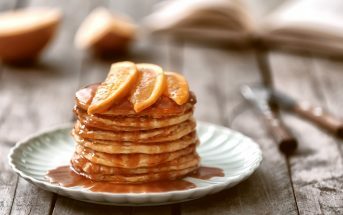 I’d like to avoid using a sweetener, so I was curious if there is a non-sugar substitute you recommend or can I just leave it out? Also, can I swap extra flour for oats if I am out of the latter? As a personal comment, this recipe works well for me and is the first “big win” I’ve had making healthy bread in my bread machine. I gave a slice to my 11 year old son who said, “yuck, this tastes like that whole wheat bread we get at the bakery.” I knew I liked the taste. I am grateful that you wrote this up for people to use. Glad it worked out so well for you Mike! The changes you want to make are all feasible, but will affect the bread’s moisture and texture, so you’ll want to play around with it a bit. If you want to swap the maple syrup without sugars, glycerin may work well, but I haven’t personally baked with it. If you leave it out, along with swapping out the oil, this will affect things. But you can add more applesauce, add more liquid – play around with it until you get that nice pliable, smooth dough. Bread can be very forgiving. Has anyone tried making this without oil ? This will be my first attempt at homemade bread without using a bread machine. Thanks in advance for any tips you have for an oil free version ! I think the fat helps the consistency quite a bit in my opinion, but you can substitute applesauce, dairy-free yogurt, or similar for the oil. This sounds like the recipe I have been looking for. I am going to try it in my bread machine, which I need to know if you would consider this a 1.5 or 2lb loaf? Thanks for all your wonderful recipes, I have a dairy allergy and get frustrated when I think I am doing well and then have problems and can’t figure out what I have eaten that was supposed to be ok but obviously wasn’t. I have decided I need to make as much of what I eat as possible. I believe it’s a 1.5 lb loaf. We’ve tried this recipe quite a bit in the bread maker, but we’re at higher altitude, so getting the yeast right was tricky (we had to lower it, but it was difficult to dial in the amount of yeast and liquid at higher altitude). I would love to know how it works out for you! I really want to try my hand at making BREAD!!!! It just looks so luscious and moist! ha ah! It’s really so easy, too! What amazing texture with the addition of the cereal- This is screaming for some almond butter on top! I was just wondering, can this be made in a bread machine? Hi Jennifer, funny you should ask this. We have started making it in a bread machine, but since we are at higher altitude (4500 ft), we’ve had to make adjustments to the recipe for it to work properly. If you are at sea level than I think it should work (haven’t tested! ), but don’t want to make promises! At higher altitude, the confined space causes the bread to soak up more moisture and collapse. We add more liquid as needed, and reduce the yeast. If a bread collapses in a bread maker, it is usually due to too much leavener. I made this recipe exactly according to the recipe. It turned out beautifully and with using plastic wrap it lasted for six days until the two of us finished it. As Alisa mentions in the heading patience is the key. It is easy to make and great to eat. So glad you enjoyed! My niece is making a bread machine version of this right now (will be posting that soon, too!). I’d love to hear how yeast does perform in that climate Hannah! I love their hot cereals, and what a great use for them. Looks delicious!